Soak the cashews in filtered water for 2-4 hours. Drain and rinse the cashews, then add to an upright, high-speed blender along with the fresh water. Blend on high speed for about 2 minutes, until the cashews are completely blended and you have a creamy, frothy milk. Add the dates, salt, cinnamon, maple syrup, coconut oil and vanilla, and blend for another 30 seconds, or until completely combined. Place the chia seeds in a large mixing bowl, and pour the cashew milk over top, stirring to combine. The mixture will begin to thicken. Let sit for 15 minutes, stirring a few times to prevent clumping, then refrigerate for at least 2 hours to set up completely (or preferably overnight). Youll know the chia pudding is ready when the mixture is thick and creamy, and there are small, tapioca-like chia balls throughout. If the gel texture freaks you out, you can also blend the pudding once set, until smooth. 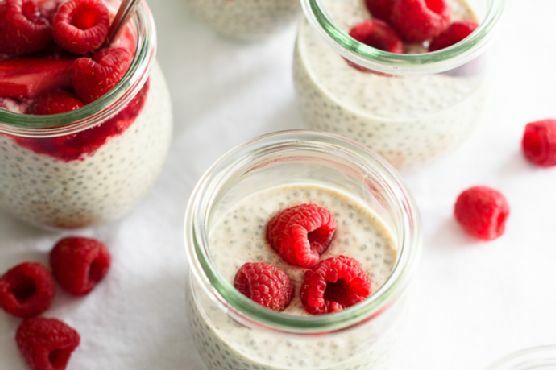 The chia pudding can be made up to five days in advance, kept in an airtight container in the refrigerator. It may continue to thicken a bit. Divide among bowls and serve with the raspberry rhubarb compote drizzled on top. Cream Sherry, Moscato d'Asti, and Port are my top picks for Pudding. A common wine pairing rule is to make sure your wine is sweeter than your food. Delicate desserts go well with Moscato d'Asti, nutty desserts with cream sherry, and caramel or chocolate desserts pair well with port.